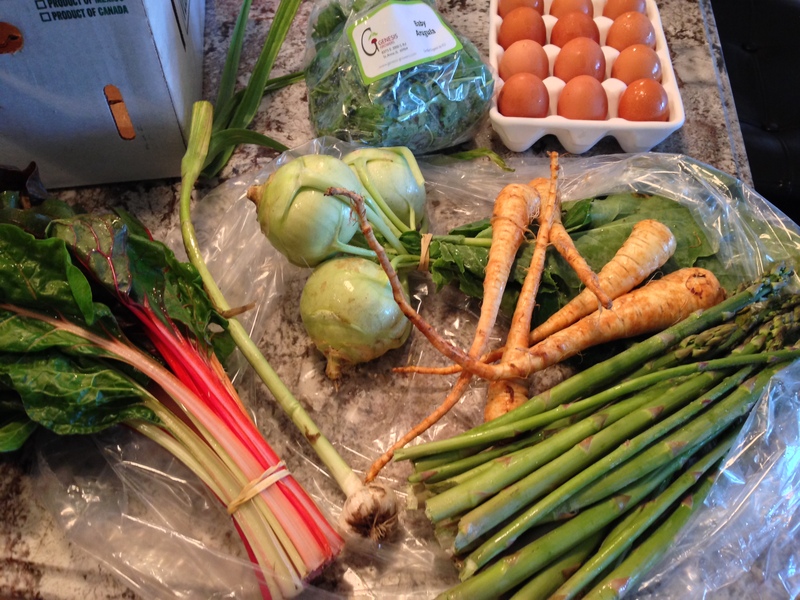 This summer we have opted to join a crop share to see what all the fuss is about. You know, supporting local farmers, eating fresh, choosing organic, and my favorite part which is eating what is in season. We are proud to have chosen Genesis Growers Farms (www.genesis-growers.com) with our pickup at the Saturday morning Green City Market. Along with the medium size box of farmer’s choice fruit, produce, and herbs we have also elected to get 1 dozen eggs. So far I have to say the eggs are my favorite thing. The taste of fresh eggs over store bought is almost criminal. Especially for me who would put an egg on anything. In our first box we got some Rainbow Chard that was just beautiful. 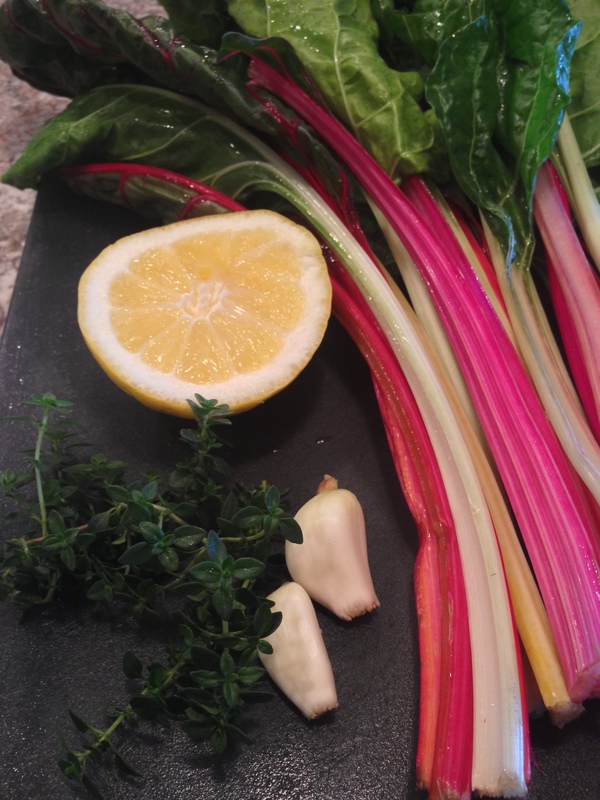 Interestingly enough I have never bought chard before, so I needed to do a little research before making a dish. 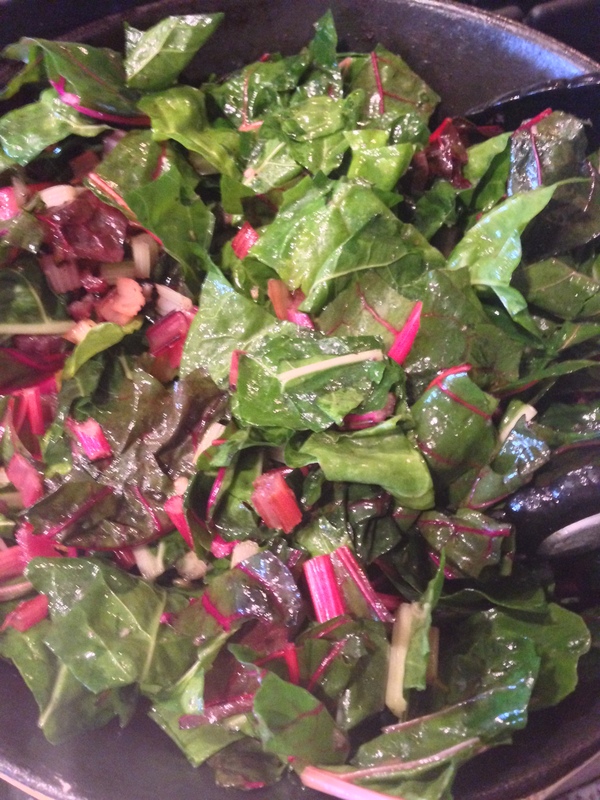 Chard is in the same family as beats and is similar to kale and spinach in flavor/cooking options. 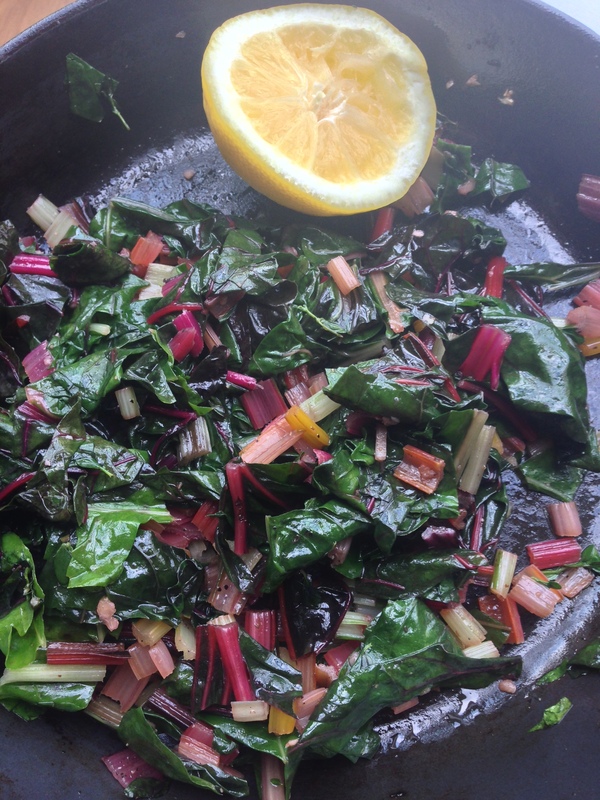 Typically chard is cooked to soften some of the bitter flavor of the greens, but can be eaten raw. 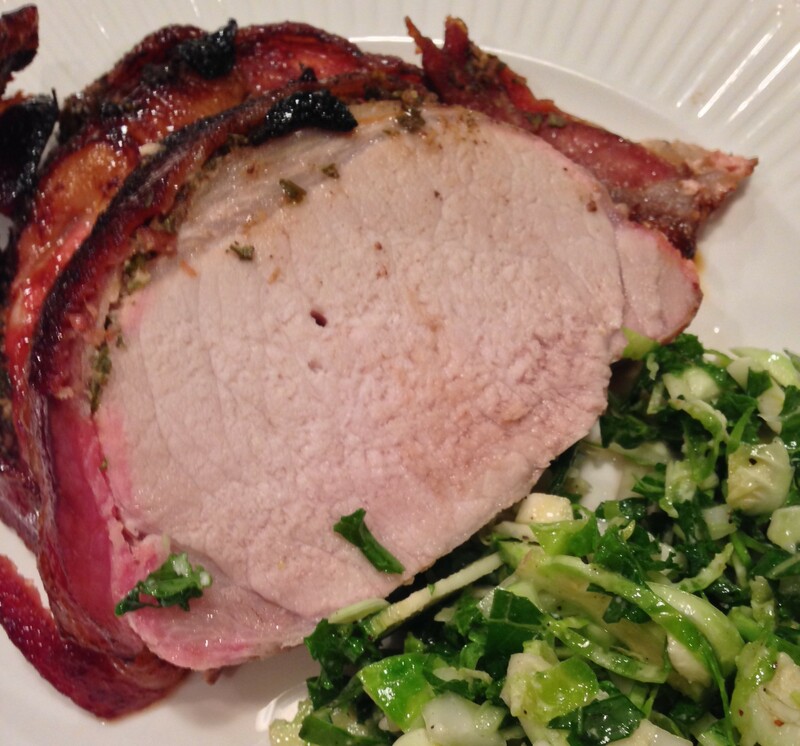 I found the greens to be more flavorful than spinach when cooked and softer than kale. Chard is a nutritious little green to add to your life, rich in vitamins A, K, and C as well as a minerals, dietary fiber, and protein (according to Wikipedia). A lot of the recipes I looked at sauteed the chard with lemon or garlic, and quite a few used fresh ginger. This got me thinking, as I have a robust amount of lemon thyme already growing in my “garden” I went the lemon and garlic route. 1. Cut the chard stems into 1/2 to 1/4 inch pieces, separated from the greens. 2. In a heavy skillet on medium heat, saute the chard stems in olive oil with the garlic, half of the lemon thyme, and red pepper flakes. 3. Allow to cook for 3-4 minutes until stems are soft and fragrant. 4. 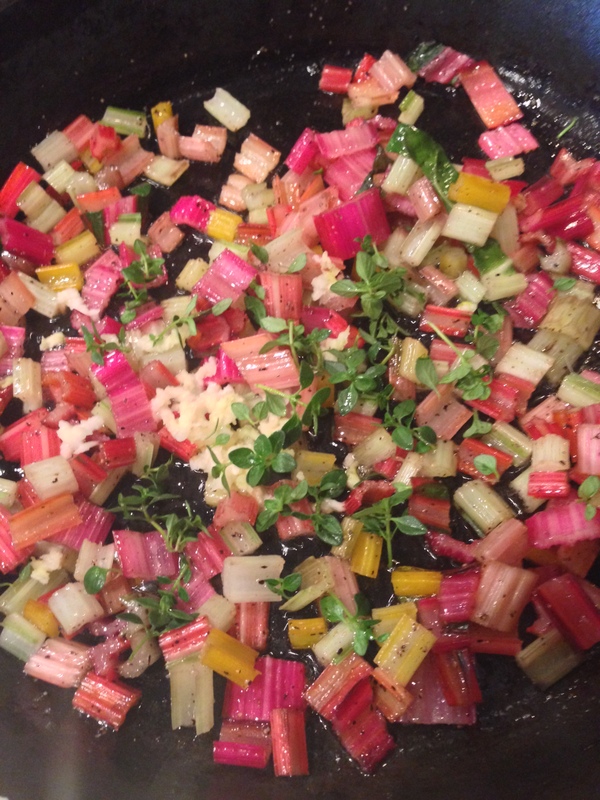 Add the diced chard greens to the pan and stir in. Cover and cook for 5 more minutes, stirring as needed. 5. Spritz with fresh Lemon, garnish with remaining lemon thyme, and serve hot. 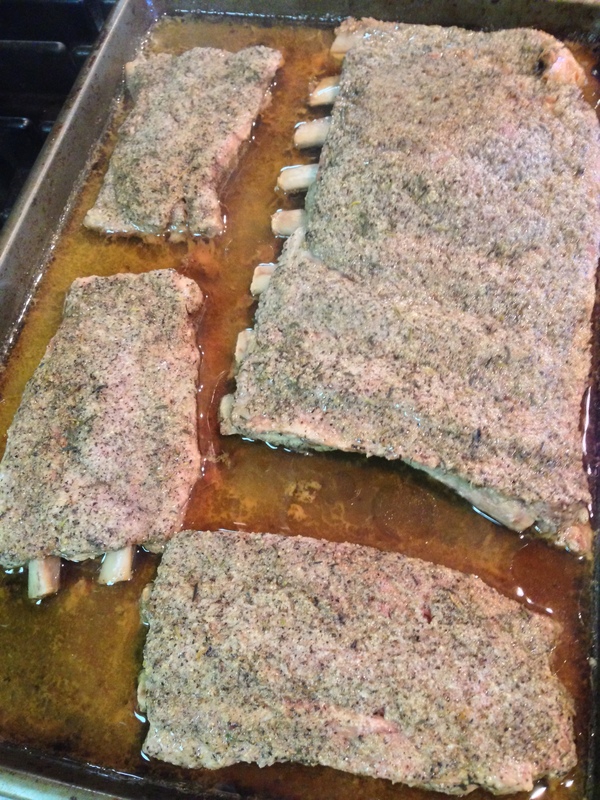 We make pork ribs as a year round dinner option. 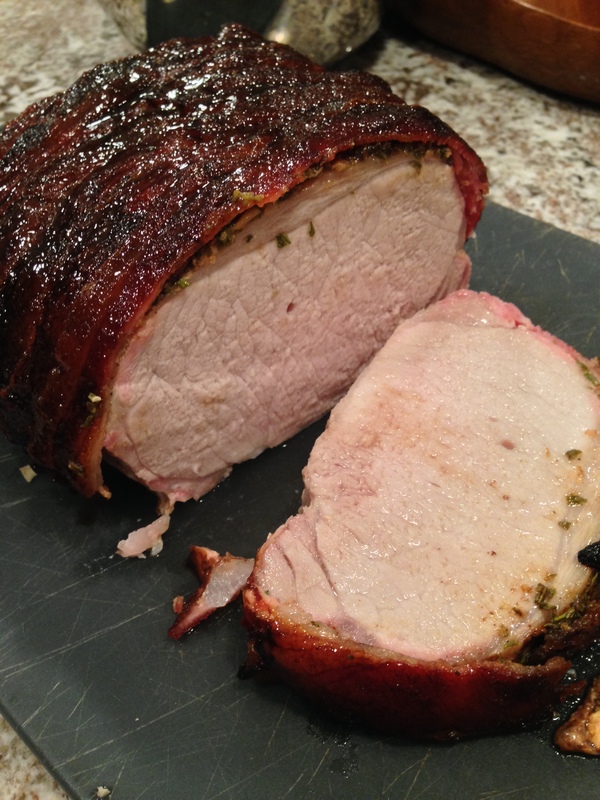 There is something so great about knowing your dinner will turn out moist and delicious with minimal effort every time. 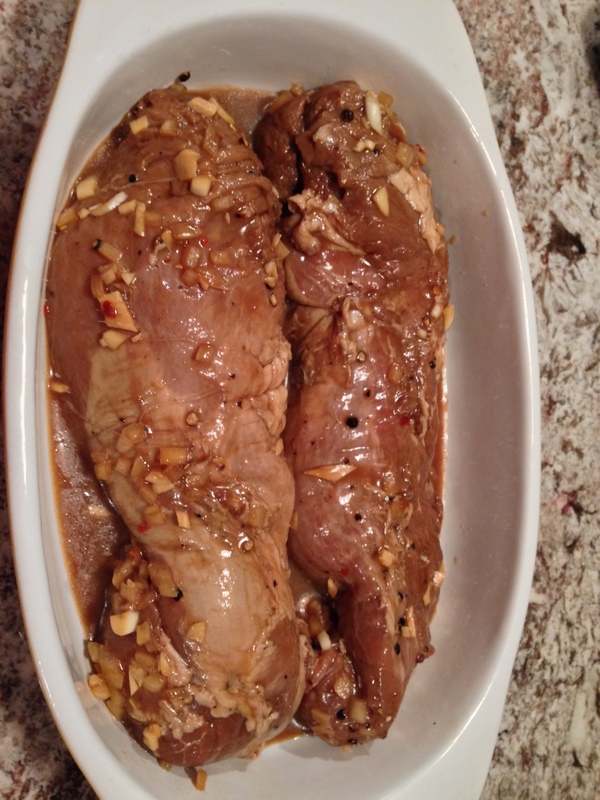 Usually I make them as the previously posted “Easy Oven Ribs” with a rib rub and spicy barbecue sauce. Tonight I wanted to mix it up a little bit, making up a rub of my own that doesn’t have the traditional spicy barbecue flavoring. With the drippings in the pan I made a gravy, but didn’t need it, so I will save it for some mashed potatoes or biscuits in the future. 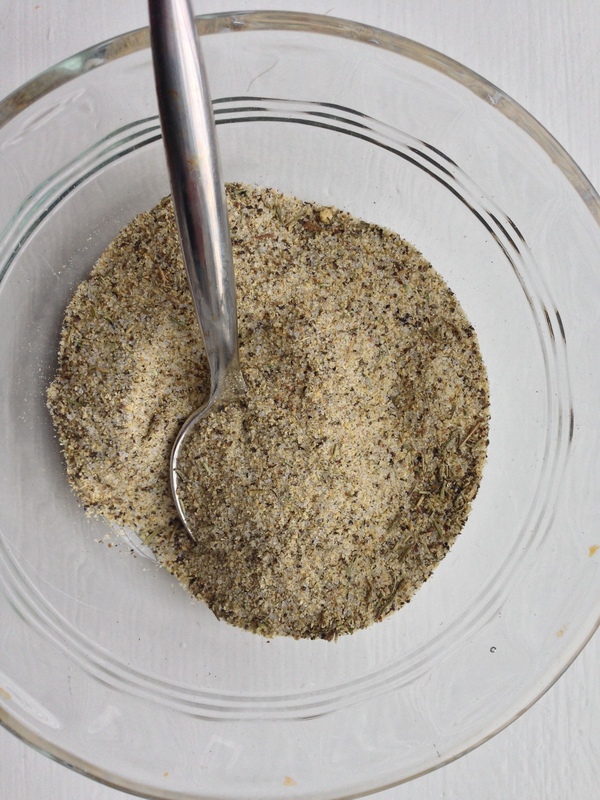 The rub is pretty versatile, if you like it I would suggest making a large portion to use on chicken, pork, or even burgers storing in an airtight container at room temperature for quick use. 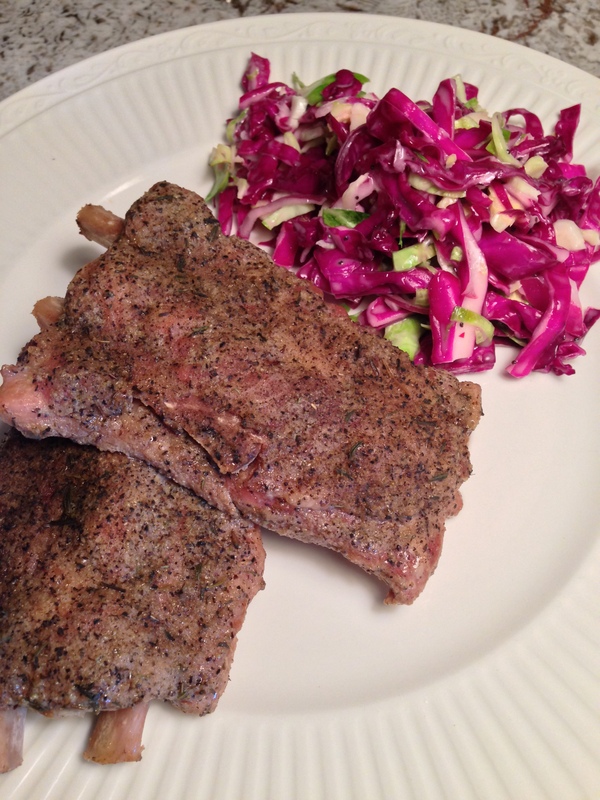 For a side I made a red cabbage and shaved brussel sprout coleslaw, using the same dressing directions previously posted for the “Summer BBQ Coleslaw”. 1. Combine all dry ingredients, stir well. 2. 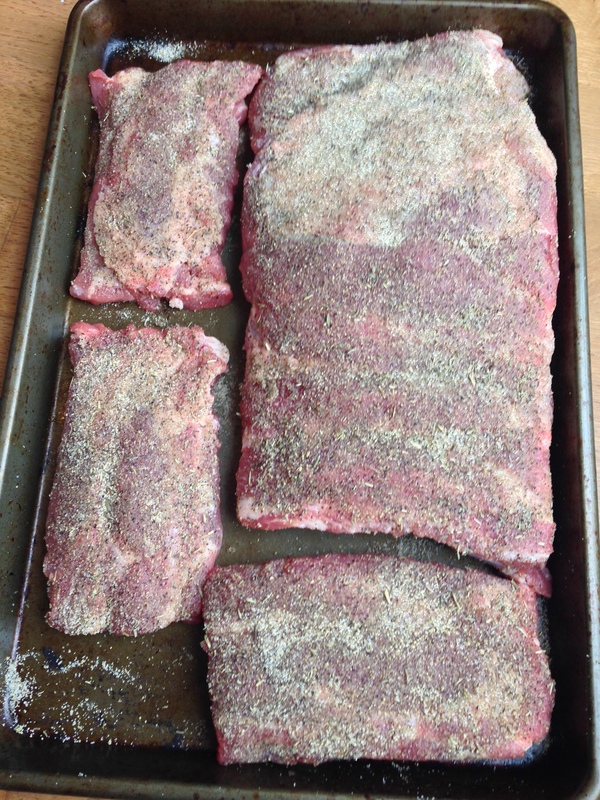 Arrange ribs on a shallow cooking sheet. 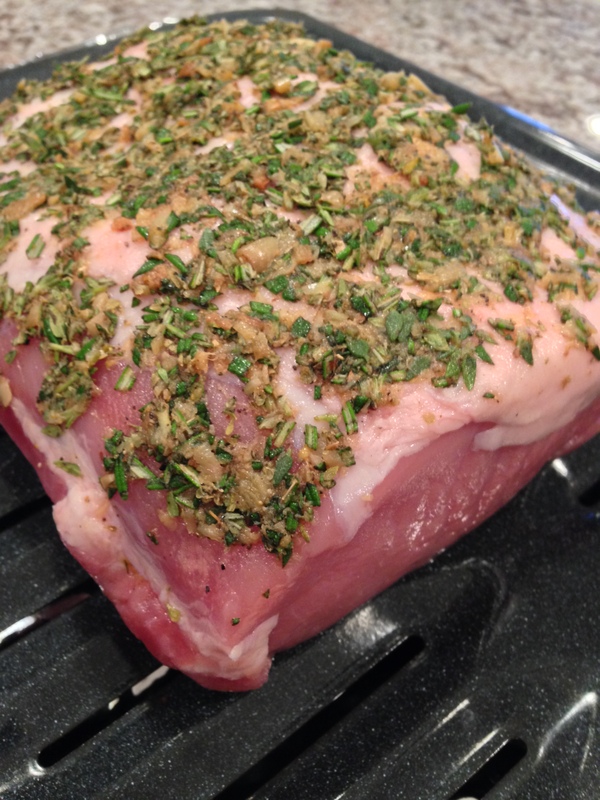 Season with rub, patting into surface of meat on both sides of the rack. 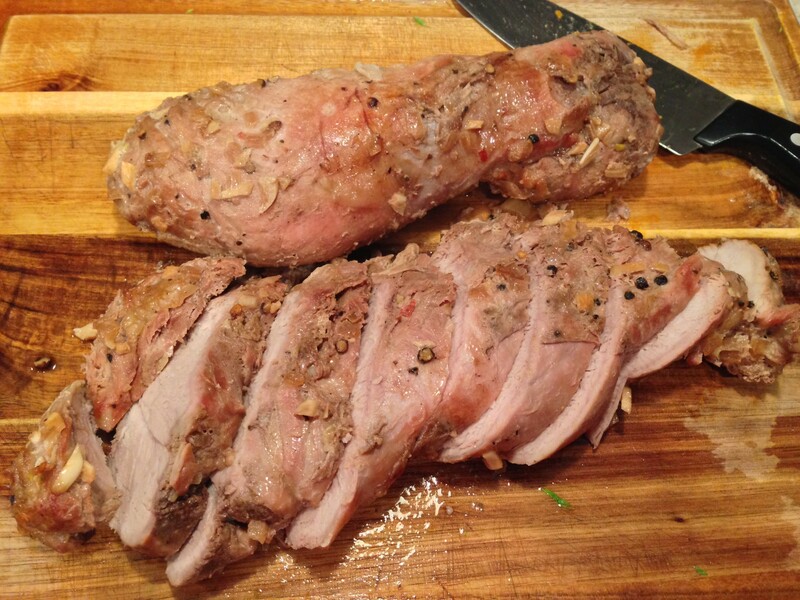 This rub is pretty potent and salty, so you don’t need to season too heavily. 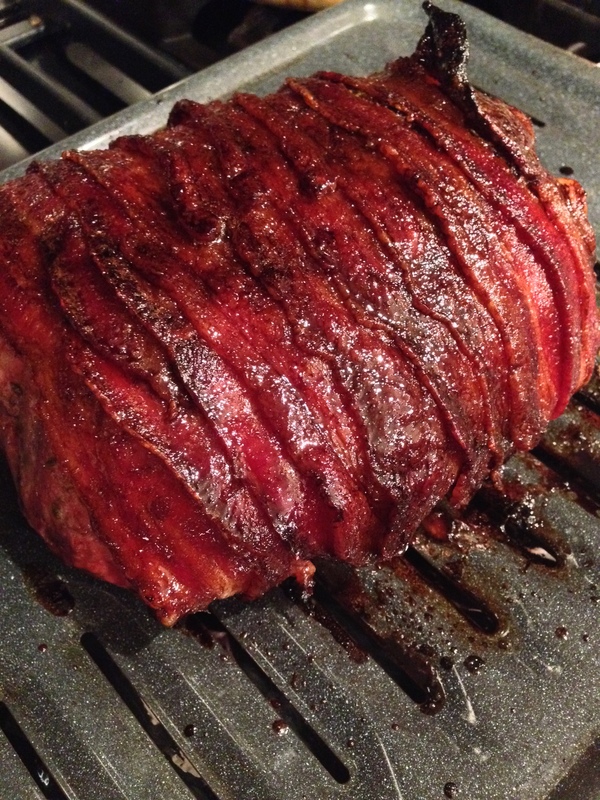 Arrange meaty side up on the cooking sheet. 3. Pour beer into the pan to completely cover the bottom and seal tightly with foil. 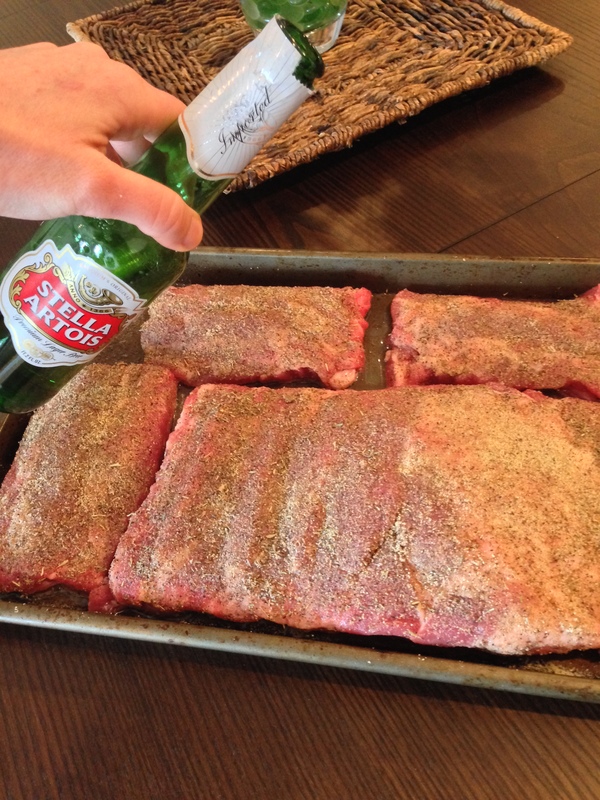 I used Stella, as I wanted a lighter beer flavor to pair nicely with the garlic herb rub. You can use anything you want, I’d recommend a pilsner or other light lager. 4. Bake in oven at 225º F for 4 hours; to speed up the cooking time without sacrificing moisture you can up the temperature to 285º F for 3 hours. To make the gravy with the drippings in the pan was so simple, and it seems such a waste to dump all that juicy goodness. I poured the drippings into a small sauce pan and added 1/2 cup of water (adjust based on taste and amount of liquid reserved) to cut some of the saltiness, then thickened with corn starch as directed. 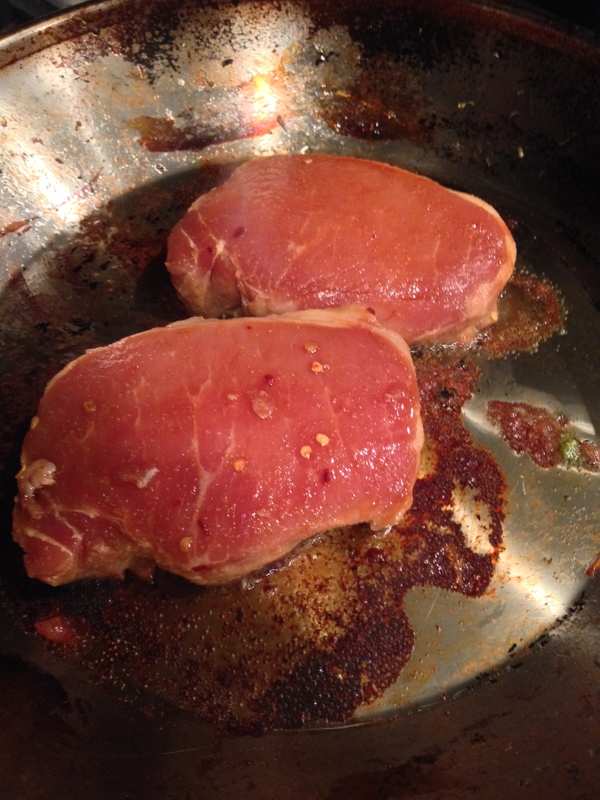 When I got the consistency I was looking for I added a small handful of diced shallots and almost a tablespoon of brown sugar. Whisking together and simmering on low for about 5 minutes. Really delicious, but like I said the ribs were so moist they didn’t need the gravy, so I’ll use it for another meal in the next day or two. Biscuits and gravy for brunch? 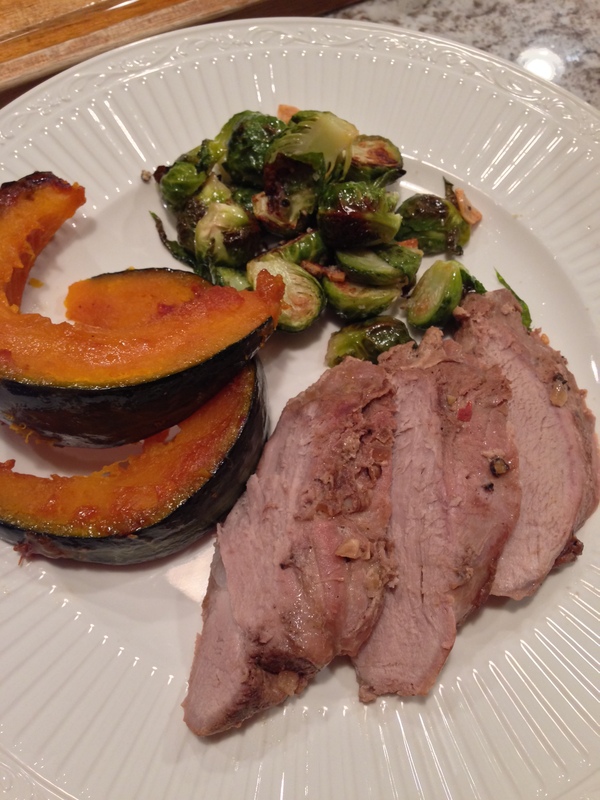 After Thanksgiving you are likely looking for something to eat that is healthy but perhaps with flavors that are out of the comfort food category. 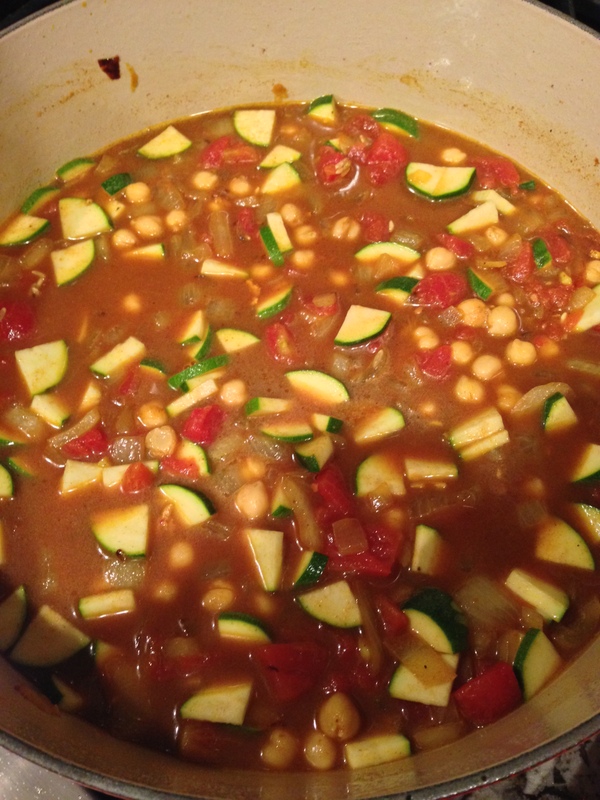 This dish is full of vegetables and has a spicy flavor that is perfect for this time of year. 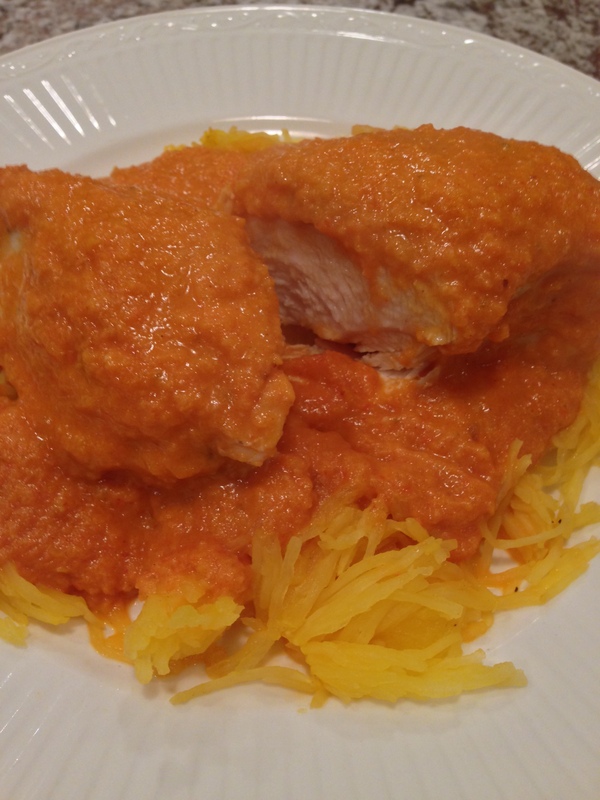 Serving on a bed of spaghetti squash cuts back on calories and sneaks in some extra fiber. I made this dish with coconut milk to keep it dairy free and change the flavor profile even further out of the comfort food zone. 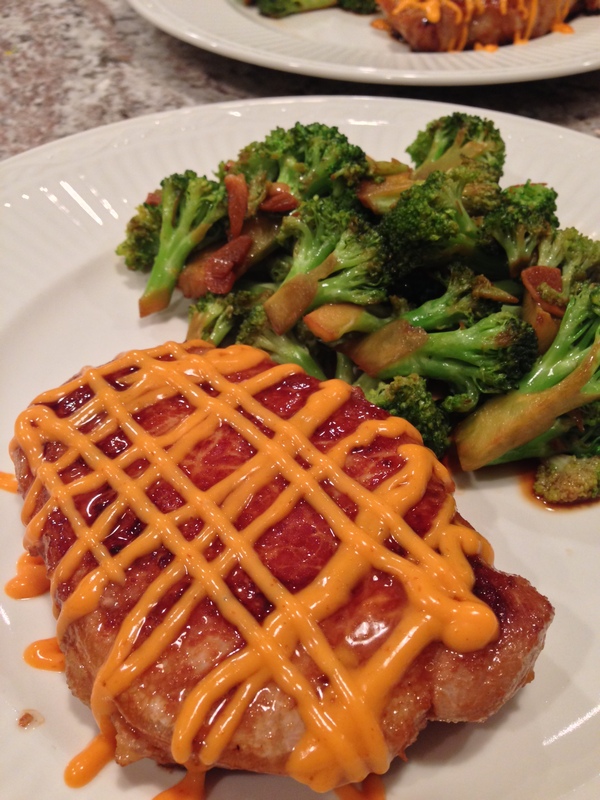 I used chicken, but this would be good with pork or even shrimp. 1. 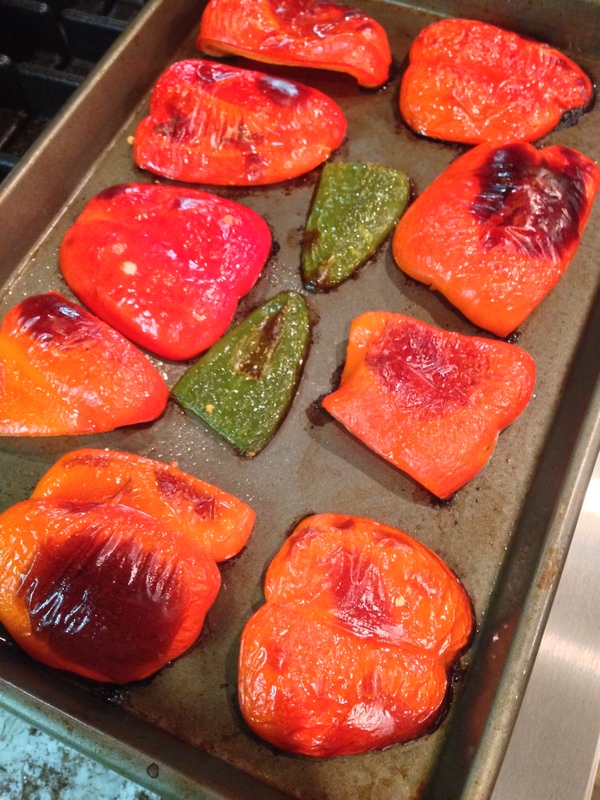 Slice red peppers and jalapeno into flat pieces, spray with olive oil and roast for 15-20 minutes at 425 degrees. 2. While the peppers are roasting heat grapeseed oil, coconut oil, or olive oil in large dutch oven, saute onions over medium heat for 5 minutes. 3. Add coriander and cayenne, simmer for 1-2 minutes until fragrant. 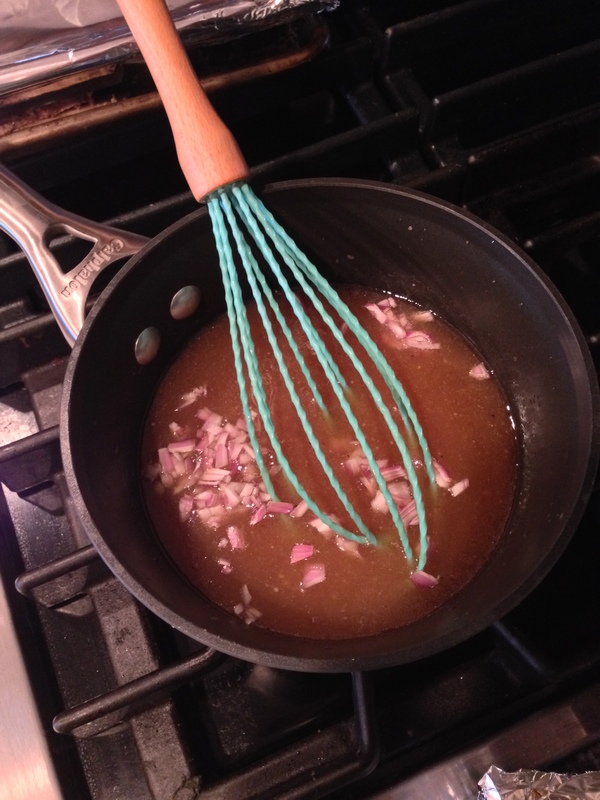 Stir in garlic and ginger, continue to heat for 5 minutes. 4. Add can of diced tomatoes including juices and mix well. 5. 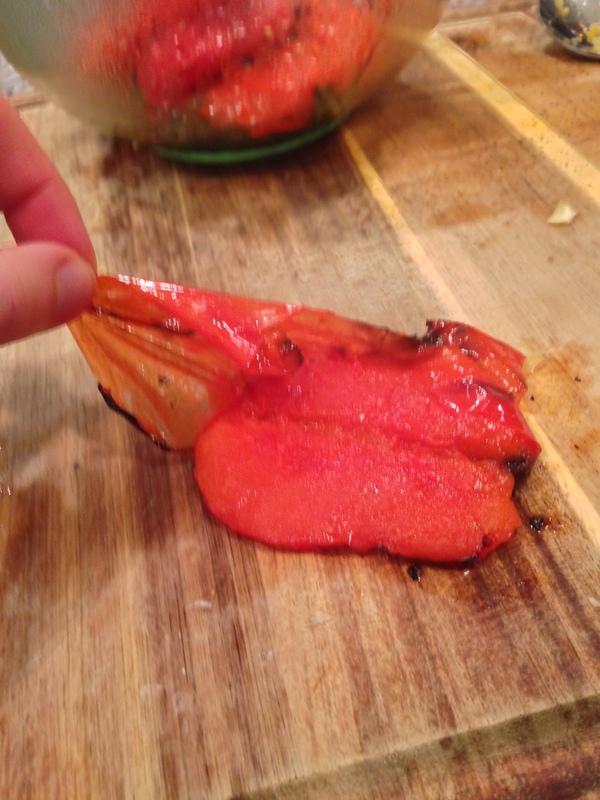 When the peppers are blackened, remove from oven and place in bowl covered with saran wrap. 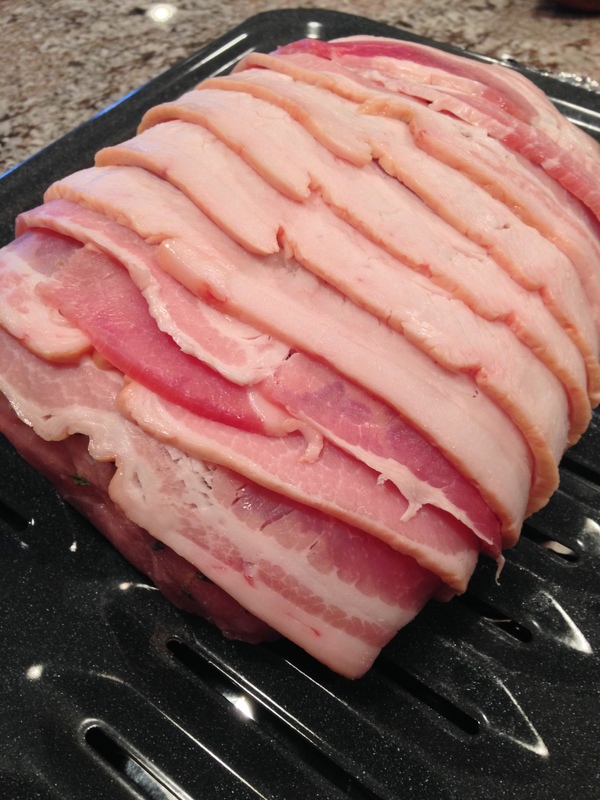 Allow to sit in bowl for at least 5-10 minutes before removing skins (sitting in steam will allow skins to slide off easily). 6. Roughly chop peppers and add to pan. 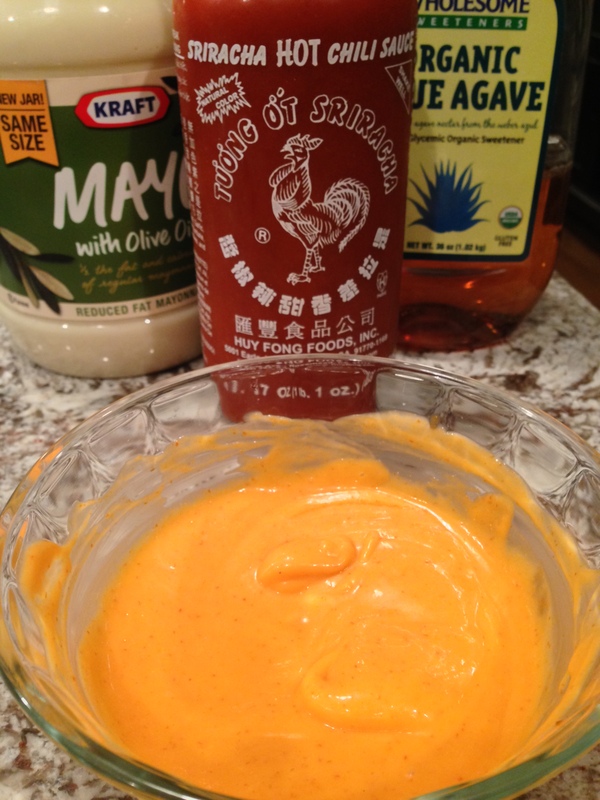 Add sriracha and truvia or sugar and allow to simmer for 5 minutes. 7. While your sauce is simmering start to brown chicken (seasoned lightly with salt and pepper) in heavy skillet for 5 minutes on each side. 8. 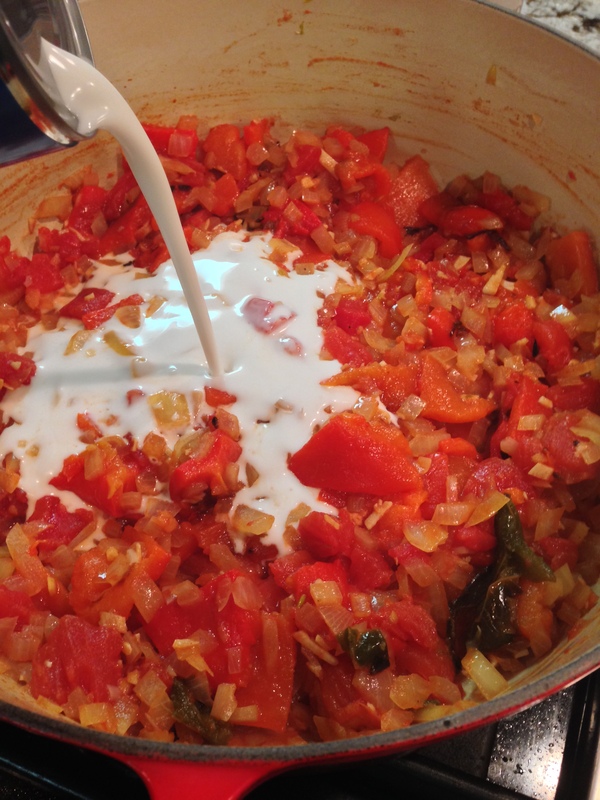 Add coconut milk and simmer for 10 minutes before pureeing. I used an immersion blender, but if you don’t have one you will have to transfer to a regular blender to puree in batches. 9. 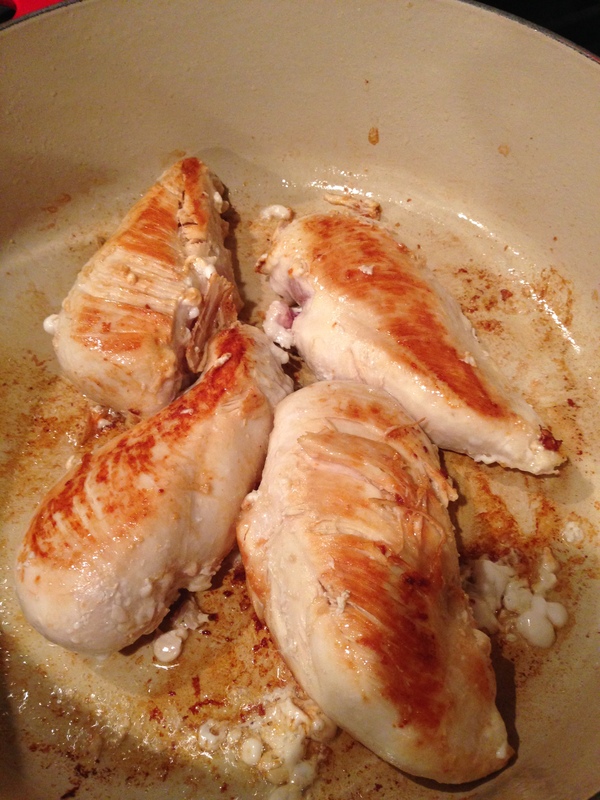 Nestle browned chicken into sauce and simmer on low for 15 minutes to finish cooking. 10. 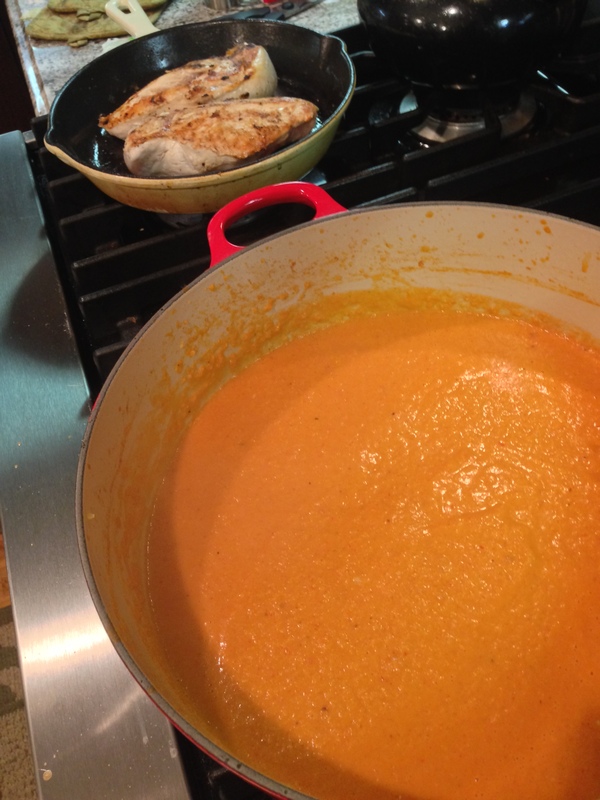 Serve over rice or spaghetti squash as pictured above.